Mailing Bags There are 2 products. They come in a range of sizes, colours, materials and designs and they allow you to send products and literature discreetly, quickly and without excess postage costs. One of the major benefits of mailing bags is that they are lightweight. That means you’re not having to pay more than you need to for the weight of packaging. That makes them perfect for contents that aren’t likely to get damaged during dispatch, or for magazines, leaflets and advertising that don’t need padding or protective layers. Having said that, they offer essential protection against rain, dust, dirt and spillages, so although they don’t weigh very much, they add a great deal to the safety of your mailing. Blue opaque mailing bags are a standard packaging material for mail order deliveries and home shopping companies. They have a plain, business-like look to them which gives the customer privacy whatever they’ve purchased. These can be ordered in a range of sizes and they are manufactured using recyclable polythene. Clear mailing bags allow your brochure or information leaflet to do the talking for you. Everyone who handles the package prior to opening will have an uninterrupted view of the contents, making it a great way to deliver advertising or company literature. These are available to order in quantities of 1000. Basically, if you’re looking for no nonsense, lightweight packaging for mailing goods that don’t need a lot of padding, opt for mailing bags. We’ll do you a great deal on them, especially if you decide to order a great deal of them! Clear mailers with no printing or text which offer excellent clarity. These 100% water repellent clear mailing bags are lightweight and cheap to post. Ideal for getting your brochure noticed when mailing through the post. Low density polythene with permanent adhessive seal. Read the full product description. Blue opaque mailing bag with self seal strip ideal for mail order and home shopping/eBay. 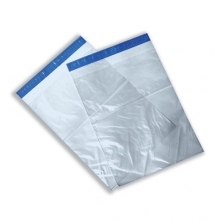 These are good quality, high strength blue opaque low density polythene mailing bags with permanent adhesive seal. 55 micron polythene. Read the full product description.